February 23, 2014 at the Cowtown half marathon was a day of firsts for me. It was my first introduction to the world of endurance sports, my first half marathon, and my first failure to reach a race goal. I finished in 2:00:51, just 52 seconds short of my goal to finish in under 2 hours. It was also where I made a commitment to myself that one day I would qualify for the Boston Marathon, one of the most prestigious and storied marathons in the world. Eventually my passion for running would morph into a passion for triathlon. Even as half marathons were replaced by half ironmans, my dream of qualifying for Boston remained. I completed my first full marathon in December of 2016 with a promising time of 3:15. After accomplishing this milestone, I knew I was ready to make my dream of qualifying for Boston become a reality. I discussed my ambitions with my coach and together we planned my race schedule for the upcoming year. I would wrap up my triathlon season in late October and shift my focus to qualifying at the Houston Marathon on January 14, 2018. As a triathlete, the marathon is a precarious event to train for. With the necessary running mileage increase comes the risk of injury, sickness (especially in this flu season), and overtraining. Additionally, my peak training would come right in the middle of the holidays and a whirlwind tour of family visits across Texas, weddings, and holiday parties. With the guidance of my coach, Amari Holmes, I was fortunate to make it to race week with relatively few issues. After a week of tapering, my wife Mandi and I loaded up the car and headed to Houston. Although my family lives in Houston, we decided to stay at a hotel next to the start line to keep race morning as stress free as possible. The race would start at 7:00 AM and I had to be in the starting corral no later than 6:45. On race day morning my alarm went off at 5:00 am. I scarfed down a bagel followed by a bowl of oatmeal and spent the remainder of the time leading up to the race stretching and visualizing my race plan. At 6:30 when I headed downstairs to the starting corral it was a chilly 32 degrees outside – perfect for running but less than ideal for staying loose and warm. Mandi and I continued our warmup with a light half mile jog to the corral and waited for the gun. 15 minutes later I gave Mandi one last kiss, wished her good luck on her half marathon and the race was on. The first few miles were all about settling in at a decent pace and keeping my heart rate as low as possible. My plan was to negative split the race. To accomplish this, it would be key not to start too fast. The qualifying time for my age group was 3:05. Finishing with a time of 3:05 would guarantee my ability to register for Boston but would not guarantee my registration would be accepted. Because the amount of people who qualify for Boston surpass the number of slots available[MD1] , in reality I would need to finish closer to 3:02 or 3:03 to guarantee qualification. I settled in at just over a 7:00 minute/mile pace, focused on staying as relaxed as possible and followed my nutrition plan which consisted of taking one Gu energy gel every 4 miles and a splash of water at each aid station. I crossed the 13.1 mile marker at 1:31:15. To reach my goal, I would have to run a sub 1:30 second half. I was feeling great. I dropped my pace to a 6:45 minute/mile and tried to remain as calm as possible. It was staring to hurt but I got a much-needed boost of energy from seeing my family around mile 17. The plan was to make it to mile 20 and put everything I had left into the final 10k. It wasn’t until I reached mile 20 that I began to realize that things were going very well. I reached the 20 mile marker 2 minutes ahead of schedule and was on pace for a sub 3 hour run. After 3 years of dreaming, months of training, and 20 miles of racing it was time to make my goal become a reality. I dropped my pace to 6:30 minute/mile and distracted myself from the task at hand by thinking about how amazing the feeling of crossing the finish line would be. The final 6 miles were a combination of euphoria and pain. At mile 23 every muscle and joint in my legs was on fire and screaming for me to stop or slow down, but with just over 3 miles left I pressed on. 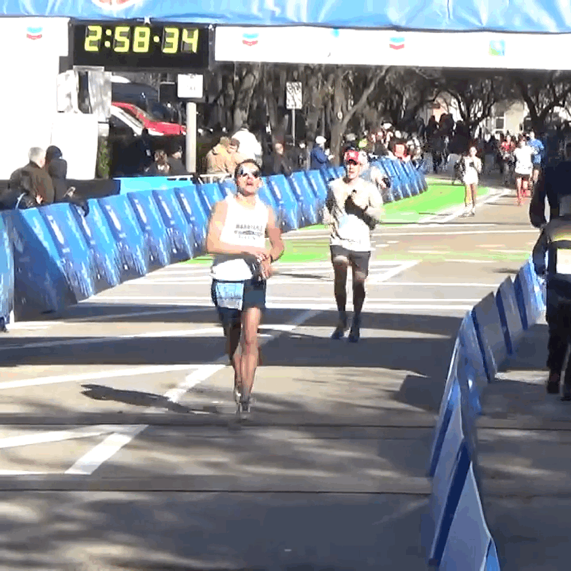 I entered downtown Houston in a state of total disbelief with less than a mile remaining. I passed a sign saying ½ mile to go and simultaneously could not wait for the race to be over but didn’t want the experience to end. A few minutes later the finish line was in sight. I glanced at my watch and saw 2:57 and I knew I had done it. 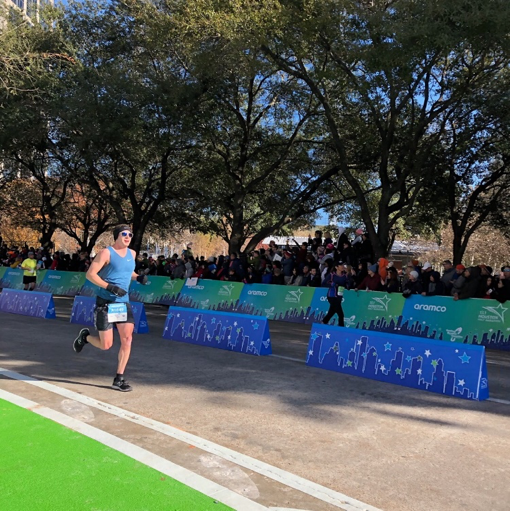 I savored the moment, took it all in, and crossed the line at 2:57:43 - seven minutes and seventeen seconds faster than the 3:05 Boston qualifying time. I am truly amazed at how far I have come as an athlete since that first half marathon in 2014. I am proof that with the right support system in place, no goal is out of reach. Playtri owner and coach Ahmed Zaher once told me there is no such thing as a crazy goal, only a crazy commitment. To reach my goal of qualifying for Boston took a crazy commitment from so many people other than myself. The Playtri family including coach Ahmed, coach Beth, friends, and fellow athletes helped me through the entire process. With the help of Dallas Sports Recovery and Massage I was able to stay fresh and avoid injury during training. Coach Amari was the mastermind behind my training and preparation. She saw my potential and pushed me to achieve my goals, providing thoughtful feedback and oversight every step of the way. Finally, my amazing wife Mandi was persistent in holding me accountable to Amari’s plan. I didn’t have to think twice about my diet because she was diligent about cooking healthy meals to fuel my training and recovery needs. We ran every step of the 2014 Cowtown together and she has been with me every step of my Boston journey. Boston, I’ll see you on Patriots Day in 2019.